We like eggs in our house and eat them every which way possible: made into an omelette, scrambled, as part of a quiche, a frittata, served with rice and fried SPAM, included in soups and hard boiled. It’s a great source of protein and our refrigerator is always stocked with eggs for a quick meal. But pickled eggs? That’s new to me. Pickled eggs are commonly seen around the South and Amish parts of the country. When eggs are in abundance, they are preserved in a brine for later use. I started seeing jars of pickled eggs at Iowa Meat Farms about a year ago alongside other pickled veggies on the shelves. But what caught my eye when doing research on pickled eggs was the bright magenta variety using beets in the pickling process for color. The longer the brine, the more color is absorbed by the egg. 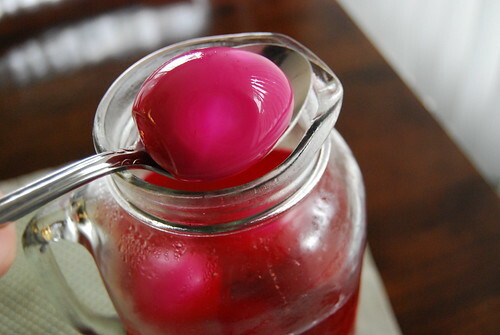 Also, the pickled beet taste increases and the egg’s texture becomes firmer. 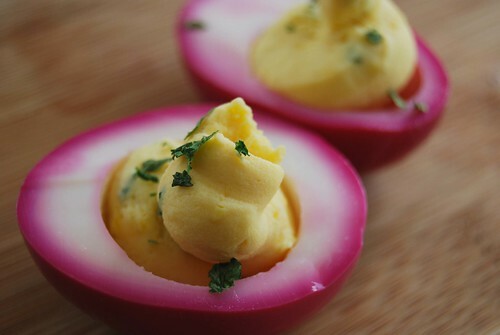 Pickled eggs are fine to be eaten on its own but are just pretty when used in deviled eggs. When making deviled pickled eggs, give yourself at least a day in advance for preparation to allow for the pickling process. Using whatever seasonings you like in your deviled eggs also works for these beet pickled eggs. The eggs in this post were brined for a 10 hours and had a slight beet taste — perfect for this beet-wary person. Supposedly if left in the brine, the eggs can be stored for longer periods. While it’s an interesting concept, you may want to do it at your own risk. 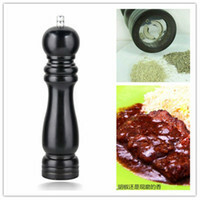 In a medium saucepan, heat water, vinegar and spices until boiling. When mixture comes to a rolling boil, reduce heat to medium and simmer for 10 minutes. Transfer mixture to tall container and cool completely. Add eggs to container, making sure liquid completely covers the eggs and move to refrigerator. Let eggs sit in mixture for at least three hours or two days maximum. Remove from brine and pat dry. Great color and I love that you used them as deviled eggs. Good for me that I love beets! I think deviled eggs is the best way to feature the bright magenta color. I would recommend soaking the eggs longer especially if you love beets. Those were so gorgeous! And they were tasty, too. I didn’t think they were too beety. Thanks! I did taste a bit of beet but I think it may have been due that I was present for the entire pickling process. Getting over beets has to be my next thing. I like the vivid color of those beetstained eggs! I’ve never had pickled eggs before. Something to try in the near future! The have pre-boiled eggs at costco, but i don’t see the need in getting 2 dozen all at once! yikes! egg overload unless one is having a large party or something. I’ll look for the pre-boiled eggs at Costco but that seems like an awful lot. You can always make Scotch eggs out of them too. What’s that on your leg…is that a scotch egg…scotch egg! Yum, I love eggs in all varieties, but I’ve never tried a pickled egg. These look like they came out of a radioactive chicken! Definitely a conversation starter! I agree about it being a conversation starter! It’s great to bring as a party food. I’ve seen the pre-boiled eggs at Costco, but I can’t bring myself to buy them when it’s so easy to boil your own. 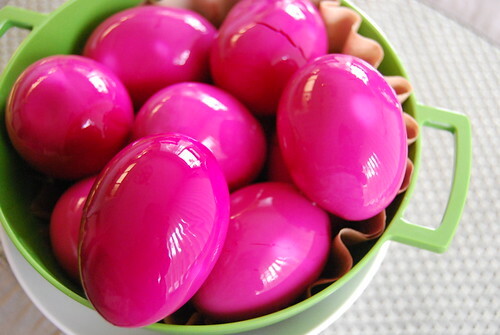 The pickled eggs are so pretty, and it’s a great idea to use them for devilled eggs. I read that if you store the eggs sideways, it will help center the yolk before you boil them. I haven’t tried it yet. I agree. Buying pre-boiled eggs seems to be a waste unless you need them immediately. Good hint about storing the eggs sideways. I’ll try that. Thanks! Love the color of these, even though I don’t eat pickled anything. I saw a comment above about scotch eggs – making those sound like fun! I’ve only ever had them at Renaissance fairs! Ah! Scotch eggs! I love those. I definitely suggest you make them. For the price of one scotch egg, you can make several of your own. These pickled eggs look so pretty. I’ll have to give them a try. They are and they make great party food! Thank you for the sweet words. Thank you! I hard boild some eggs for pickling and they peeled awfully. Some lost some white meat and some tore all the way to yolk. So I was wondering are these still safe to pickle? I boiled jars and kept all sterile.